The Skelmanthorpe Brass Band Community would like to say a huge thank you to The Co-operative Group’s Community Fund, which has recently awarded us £500. This money will be used to buy new music stands for the new band room which is due for completion in Spring 2014. 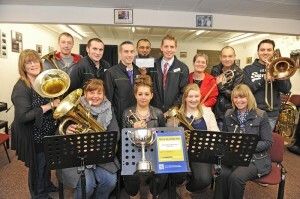 The cheque was presented by the Co-operative’s area manager.